This is a Scottish Football picture taken at Hamilton Museum. Hamilton museum is a relatively small local museum which plays host to temporary exhibits and this was one dedicated to football (soccer). 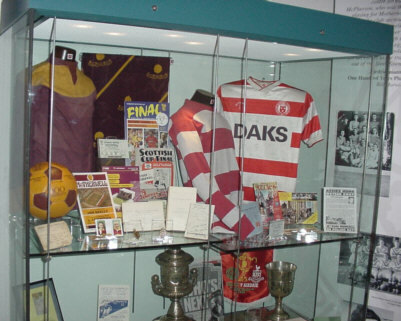 The picture shows old football strips of the local teams (Hamilton and Motherwell) along with other football related materials, programmes, cards, vouchers etc.